By October 1786 the Prince was looking for a permanent Brighton residence and rented from Thomas Kemp a small farmhouse in the fashionable centre of Brighton. A year later, after much pleading and many promises by the Prince, the House of Commons agreed to clear his debts and increase his income and he was able to transform the Brighton farmhouse into a modest villa. 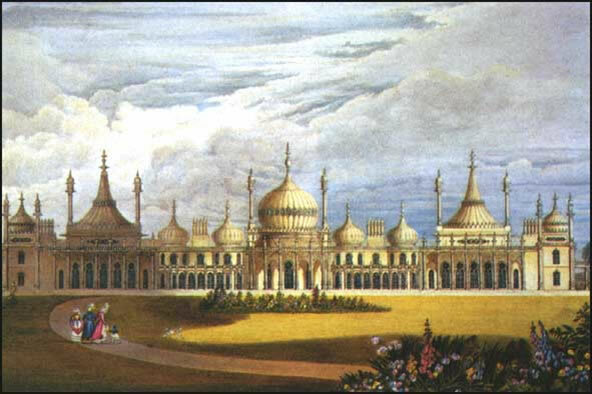 Henry Holland, the Prince’s favoured architect, was employed to build a new house on the site, known initially as Brighton House and then as the Marine Pavilion. It was a classical two-storey villa in the shape of a letter ‘E’, timber-framed and faced with cream-coloured mathematical tiles. At the centre was a domed salon with six Ionic columns, while an Ionic portico provided the entrance on the western side. The interior was decorated in French style. By 1801 the Prince was considering alterations to the house and with his love of visual arts and fascination with the mythical orient, he asked Holland to draw up an oriental plan. A year later George was presented with some rolls of Chinese wallpaper which were subsequently hung in the gallery; he was so taken by them that he ordered the whole interior redecorated in Chinese style by John Crase and Sons. Construction of the stables (now the Dome theatre) was begun in 1803, and in 1805 the grounds were laid out by Messrs Lapidge and Hooper. By 1808 the new stable complex was completed with an impressive lead and glass-domed roof, providing stabling for sixty-two horses. In 1811 the Prince of Wales was sworn in as Regent since his father, George III, had been deemed incapable of acting as monarch. At that time the Marine Pavilion was a modest building in size, not suitable for the large social events that the Prince loved to host. In 1815 he commissioned John Nash to begin the transformation from modest villa into magnificent oriental palace. The construction was to take over six years, with progress hindered by the Regent’s precarious financial state and opposition in the House of Commons to his constant requests for further funding. Nash superimposed a cast-iron frame onto Holland’s earlier construction to support a magnificent vista of minarets, domes and pinnacles. No expense was spared on the interior either: a suite of private apartments was planned along with large public rooms such as the Octagon Hall, the Yellow Ante Room, the Red Drawing Room and the immense low-ceilinged Long Gallery. The three grandest and most spectacular rooms were the Banqueting Room, the Saloon and the Music Room. It was in these apartments that the cream of society was lavishly entertained at the Prince’s famous dinner parties and musical evenings. The palace’s dramatic room designs, their different colour schemes, different room heights, the overwhelming gilding and decoration, added up to an entirely new experience after the neo-classical interiors popular at the time in many country houses. But design was not at the expense of comfort and convenience and the Regent insisted that his architect paid particular attention to lighting, heating and sanitation, as well as to the provision of the most modern equipment of the day for the Great Kitchen. In 1821 he had gas installed to light the decorative glass windows at night, at a time when widespread domestic use was many years off. The Prince bought substantial acreage all around the original house, enabling Nash to construct the Pavilion gardens as a pleasure ground, with winding gravel paths and shaped beds planted with seasonal herbaceous plants and clusters of shrubs and trees. In a largely treeless environment, it provided an oasis of shade on a hot summer’s day. The Regent became king in 1820 and due to increased responsibilities and ill-health, he made only two further visits once the interior of the Royal Pavilion was finally finished in 1823. But his interest in Brighton lasted for over forty years and his presence had an enormous impact on the prosperity and social development of the town. The population grew from around 3000 in 1786 to 24,000 in 1821, to over 40,000 in 1831. The rebuilding of the Prince’s home provided work for tradesmen, labourers and craftsmen and the presence in the town of the Court, the Royal Household and numerous members of ton society proved invaluable for local businesses. On his death in 1830, George was succeeded by his younger brother, William IV, who continued to favour Brighton. 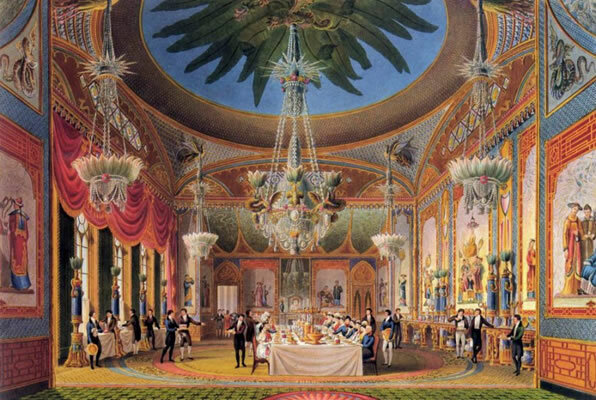 He was a very different character to his brother – domesticated, affable and eager to court popularity – and although he and his wife, Adelaide, continued to entertain at the Royal Pavilion, it was in a much more informal style than the glamour and extravagance of former decades. William died in 1837 and his niece, Queen Victoria, became the owner of the Pavilion. She felt uncomfortable with its style and its association with her profligate elder uncle. And she hated the lack of privacy, feeling unable to walk in the gardens or the town or by the sea without being annoyed by crowds of onlookers. As her family grew and the Royal Pavilion failed to provide her with the space and privacy she needed, Victoria finally sold her uncle’s pleasure palace to the town for £50,000 in 1850 and built Osborne House, a secluded family home on the Isle of Wight. The Pavilion has remained the property of Brighton ever since and many of the handsome seafront squares and crescents that still stand today are attributable to the arrival of George IV and the fashionable Regency era.